I've been interested in the Teaching Unplugged “movement” for about 6 months, now. I first read about it on Martin Sketchley's ELT Experiences blog, when he talked about his Dissertation research on Dogme ELT. I read as much as I could find online about it, and I wrote a few reflections (Dogme ELT and Teaching Unplugged). 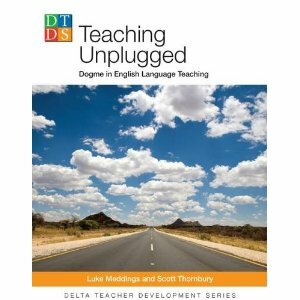 Well, I FINALLY ordered the Teaching Unplugged book, and I've been reading it for the last two weeks, trying out some of the activities, and giving the practice of teaching unplugged as much of a chance in my own situation (material-driven). Here is my review. When I received this book in the mail, I was really quite shocked at how thin it was. Most books that I've read or referenced on teaching and language have been at least twice as thick, However, the information inside is probably comparable to the amount of information in a larger book. The text is on the small side, and fills up every page almost completely. Luckily, the layout and the organization of the book is clean, which made it fairly easy to read, despite the large amount of tiny text on the page! The book is organized into three parts. Part A is a brief history-philosophy with an explanation of the core values of Unplugged Teaching. I found this section to be interesting, but on the whole, very theoretical. It wasn't particularly founded in (or backed up with) any objective research showing how the different principles had been tested or what the actual effect of the teaching on the learners had been (besides that they were more satisfied, etc.). In that way, I was a little disappointed because this aspect has been missing from most of the reading I've done on Dogme ELT, and I was hoping the book would remedy that. While the theory of Teaching Unplugged that is presented is very inspiring and easy to read, it is basically a concise and detailed summary of what is available to read online. Part B is the most substantial section in this book, and in my opinion, where the book shines. It's about 60 pages of Unplugged activities that can be done in the classroom, with instructions and suggestions that follow it. My husband and I have each used several of these activities in the last two weeks and have been pretty happy with the results. More on that in my next few posts. I don't want to go in to talking about the activities themselves, but I will say that even if you are not convinced about Teaching Unplugged, the ideas and activities in Part B make this book a valuable resource for freer in-class communicative activities. The third section, Part C, is a short chapter that talks about the environments and situations where it may seem that Teaching Unplugged would be problematic. I'll admit that I didn't read the whole section because some of the subsections (including Unplugging a School, Teaching Exam Classes, and Teaching as a Non-Native Speaker) weren't immediately relevant to me. However, I read the sub-sections that were relevant to me, and I found them to be informative, especially the part about Teaching with a Coursebook. Some people may disagree with me on this point, but the element that I felt was missing from this book was a detailed explanation of how to work with emergent language. True, the book had a large sub-section in Part A, as well as a page-spread in Part B, but at the end, I still felt that I didn't understand emergent language or how to take advantage of it with the Teaching Unplugged approach. Perhaps the authors felt that this book was not the place for such a discussion, but it seems to me that since it is such an important part of Teaching Unplugged, and since many teachers are trained in the traditional grammar instruction methods, it should have received more attention. Overall, I think the book is a worthwhile read for any teacher, whether or not he or she is interested in (or convinced by) the Teaching Unplugged approach. As I said earlier, Tim and I have both used several of the activities, and we've been encouraged by the response from our students. I'll be writing soon on some of the Unplugged activities I've done from the book, and how they turned out. Its really an Excellent post. I just stumbled upon your blog and wanted to say that I have really enjoyed reading your blog.